Provides maximum comfort with its anatomical pouch technology, giving you natural positioning with no need to re-adjust. It has been manufactured for those men with larger thighs due to it preventing chafing on the inside of the leg, it is also ideal for the active man. The soft material is eco-friendly, anti-bacterial, anti-fungal and hypo allergenic and you never have to worry about it shrinking, fading or losing shape. The 4-way stretch fabric allows for free movement no matter what sport you are playing. 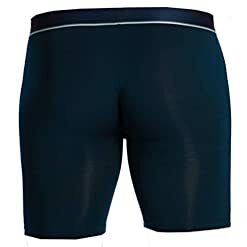 The Obviously Mens Midnight Blue PrimeMan AnatoMAX Boxer Brief 9inch Leg is a very popular item which is sure meet your shopping requirements. Highly recommended Obviously underwear make great gifts. Buy the Obviously Mens Midnight Blue PrimeMan AnatoMAX Boxer Brief 9inch Leg now.